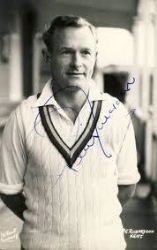 Referred to as ' Pete ' throughout his career as a batsman, P E R played for Worcestershire as a left handed batsman and was eventually selected by Captain Sir Peter May to open for England throughout the mid 1950's, accompanied by the late Lord Cowdrey ( Kent CCC ) as his partner. They not only distinguished themselves on the pitch for England but both frequently scored centuries for their clubs. PER was in the same Peter May side which saw The Rev. David Sheppard ( later to become Bishop of Liverpool) batting further down the order, in defence of the 1956 Ashes series here in England. He has a younger brother D W ( Dickie ) Richardson ( OH 1944 - 1950 ) who also played cricket for Worcestershire and later Kent.